1253 Manor House and wood and stone church built on the present site of Theydon Hall. Charter granted to Theydon Garnon by Edward I. The community is small but by now is called Theydon Bois. It is one of the few villages in Ongar Hundred that did not have to pay taxation because there were fewer than 10 householders. 1535 Royalty visit the area. Mummers and travellers visit Theydon and entertain the village folk. Bull Inn dates from this time. Remained a residential tyle-house until 1717 because the village was too small and travelers too few to support. 1735 Benjamine Smart living at Birch Hall, Theydon Bois is the Lord of the Manor. 1753 Benjamin Smart builds almshouses in the village. 1770 Highwaymen, including John Rann ("Sixteen String Jack") are frequently in the Epping Forest area. About 12 houses round The Green and few elsewhere in the Parish. 62 Oak trees planted along The Avenue across The Green by Robert Westerby Hall-Dare, Lord of the Manor. New school built in Coppice Row. Forest lands were being enclosed and it appeared that Epping Forest might disappear. 1843 Proposal to build a new Parish Church in Theydon Bois. St. Mary's Church built and the old one on Abridge Road pulled down. Railway reached Loughton from London. Windmill on Bell Common pulled down. 20 houses built on Piercing Hill. Epping Forest Act passed and many enclosed plots were reopened . Epping Forest dedicated by Queen Victoria at High Beach. First footpath along the northwest side of The Green. First modern houses on the Blackacre Estate and Woburn Avenue. Police station built on the corner of Forest Drive where the new flats now stand. Terraced houses built on the southwest side of The Green and along Theydon Park road. School partly demolished due to poor foundations and new school built. Now the College of Preceptors (or Teachers) this has recently been sold. Electricity came to the village. Census: Population 1504. Households 395. 1940 Parachute Mine explodes on The Plain demolishing "The Retreats". 1943 The Theydon Bois Rural Preservation Society formed. The Village association formed to coordinate local organisations. Railway electrified and became part of the 'Underground'. Census: Population 2665. Households 849. Theydon Bois Count Primary School built in Orchard Drive. Census: Population 3925. Households 1268. Theydon Bois Baptist Church built. The Village Hall was built. Census: Population 4122. Households 1360. Census: Population 3946. Households 1530. Work starts on the New Village Hall. 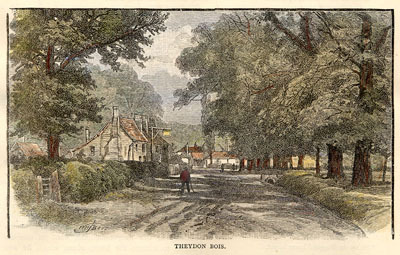 Much more on the History of Theydon Bois Is available at the British History on Line Website.